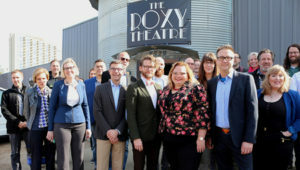 The Roxy Theatre project, Edmonton, receives $2.5 million from the city. The City of Edmonton  will provide $2.5 million to the Theatre Network to help support construction of a new facility to replace the original Roxy Theatre, destroyed by fire in 2015. The new facility, to be located on the site of the original theatre, will include three performance spaces and integrated backstage and front-of-house areas. In a nod to the past, the design of the building entry will help recreate the historic character of the Roxy Theatre marquee. Ground breaking is expected in spring, and is slated to open in time for the 2020 theatre season.